Happy Spring everyone...or is it really spring?!?! We just had a spring nor'easter which makes it the fourth blizzard to hammer the Northeast in three weeks! Despite the recent crazy extreme weather, spring is my favorite time of year not only because of warmer weather ahead but mostly because it is the start of competition season! I do hope everyone is as excited as I am! I have a couple of students preparing to compete for the first time and I can't wait to see them perform and have a great time on the ice. I, too, am preparing for the new competition season and have been working tirelessly on my short and free dance programs. My first competition is on Saturday, April 7 and it will be a very long and tiring day as I will be at the rink all day, competing from 10:45am till 9:30pm. My skaters who are members of the Learn-to-Skate USA program are eligible to participate in local competitions offered through Compete USA. This is an introductory competition program sponsored by U.S. Figure Skating and is designed to promote a positive and fun competitive experience for beginner skaters. 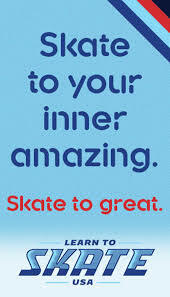 Compete USA incorporates all the skills taught in the Learn-to-Skate curriculum and is judged in a competition format. Competitions allow kids to perform for an audience and show off their skills. It is a lot of fun choosing music, learning new choreography, and getting to wear a beautiful sparkly dress. Moreover, you get to have your hair done and wear full-on makeup- it will be the only time your mother won't be against you wearing makeup! At competition, you can make a lot of new friends by meeting new skaters who compete at your level from different rinks. But best of all, you can win a medal! There can only be 6 maximum number of skaters competing in a group and all six skaters receive a medal.